Author bio: Ronan is Head writer and President, SampleResumesOnline.com; National Career and Resume Expert. Blurb: Resume and Cover Letter Samples Package. -Taking the work away from resume and cover letter writing. No stress, no headaches any more. -Spending the hours and hours it takes to write powerful resumes and cover letters that been proven to get interviews and results. -Adding special buzzwords specific to each industry. -Providing you with a way of creating a powerful marketing document at a fraction of the cost of a professional service. -Ensuring you do not need to learn any complicated resume software. -Placing everything you will need on one page more on that in a moment $422 worth of free job search books and tools. 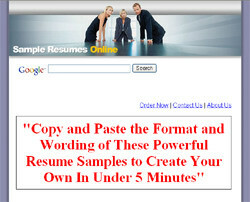 -Finding a way to make creating a great resume that is easy and hassle free. -Giving you a resource that can let you create that resume in minutes instead of weeks. -Making the whole experience enjoyable and educational. -Giving you a package that is reusable and relevant for years to come. -Be formatted specifically for your career and industry. -Use compelling copy and buzzwords to make you stand out from the crowd. -Market your skills and experiences. -Articulate your qualifications in the most effective way. -Be the best possible reflection of you. -Be clear in its objective and what the benefits to the reader are going to be. -Be very frank and use this opportunity to meet and state your case. -Must not use long sentences or paragraphs that are distracting or demonstrate poor use of language. If you have a resume and cover letter like this you will blow the competition away. And you have the chance today to download hundreds of resumes and cover letters just like this. You can copy and paste the wording and formats to create your own resume that will ensure you have the best possible advantage for your job search. -Every industry and career to choose from - graduate, management, service, desk job, technical resumes. -Use whatever professional format you choose. -Choose the best parts from any resume or letter to suit your situation. -Samples to cover all levels of careers. -Create as many different resumes or letters as you like geared for different careers. -Be finished in an hour or even minutes. -Create a powerful document that sings hire me to your potential employer. -Job Search Bonuses of $422 value more in just one moment. -Save 90% by using this package and not going to a resume writer.